Our open-plan business center, set off of the lobby, is a great place for guests to work or use as a spot to take a quick business call or print out some documents. It is free for guest use and can be made into a more private space with the quick closure of a curtain. The hotel offers guests two areas to work. The business center, located just behind the lobby, is a semi-private space that has a long conference table, computer, printer and high-speed WIFI. 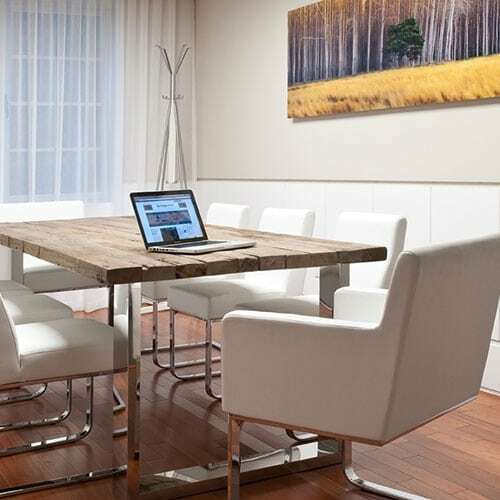 Good for groups, the space can accommodate a group up to 6 people or a few guests looking for a table to spread out while they work. The second area suited for working is an indoor lounge area located on the ground floor. The quiet, secluded space is outfitted with a TV, comfortable couch and lounge chairs. This area is great for business calls, quick Skype sessions or some quiet reading.